It’s time for evil — or, more specifically, E.V.I.L. 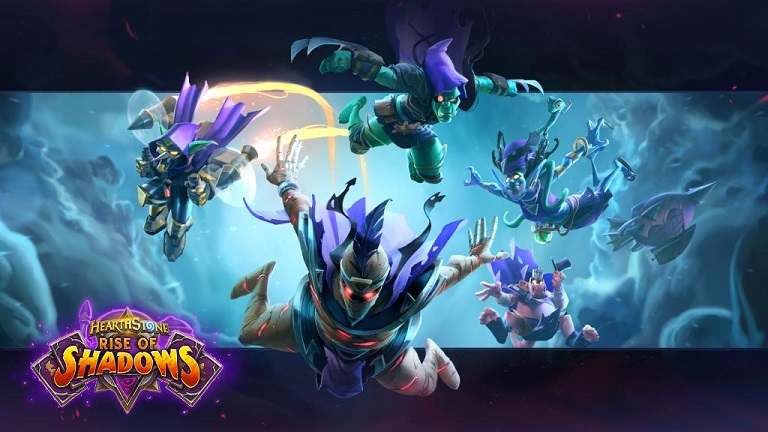 — to take center stage, as Hearthstone‘s latest expansion, Rise of Shadows, is now live. The 135-card set focuses around the villainous members of the League of E.V.I.L., with new cards and new mechanics to match their nefarious schemes. We covered the new mechanics — lackeys, schemes, and Twinspell — in our initial look at the set when it was announced last month. To commemorate the new set, Blizzard is offering up some simple quests quests players can do to earn themselves free packs, both from the current set and from previous ones, over the next several days. For today, you simply need to play 25 cards in Play mode to receive one Rise of Shadows and one The Witchwood pack. Other quests offer similar goals for one Rise of Shadows pack and one from a previous set, culminating in Day 5’s quest, which gets you one pack from the current and last three sets for playing 100 cards. Another freebie you get just for logging in is the legendary neutral minion Archmage Vargoth. As for another tradition that’s been a part of recent expansions, there is a single-player adventure in the works, but it won’t be ready for a few weeks. In it, you’ll take on the role of a minion of E.V.I.L., with orders to infiltrate Dalaran and make off with some of its magical treasures. The release of the expansion also denotes the start of a new Standard season, the Year of the Dragon, removing cards from Journey to Un’Goro, Knights of the Frozen Throne, and Kobolds & Catacombs from the mix. Arena mode also sees some changes, with available cards coming from a selected group of expansions, as opposed to just drawing from the Standard pool. Check out Rise of Shadows in the Blizzard launcher, or learn more about the set on the Hearthstone site.